Kyoto, 1974. A new physical education teacher arrived at Fushimi Daiichi Kogyo High School, a high school shattered by school violence. 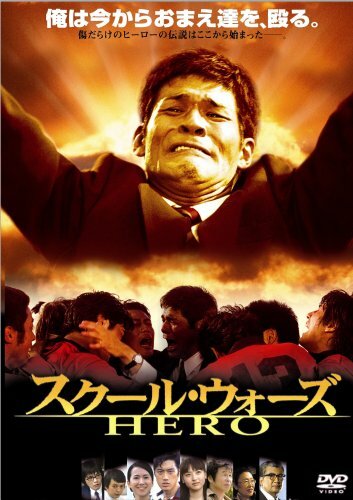 Shuji Yamagami (Shoei), a former star of the Japanese national rugby team was promised a position as the head coach of a famous corporate rugby team but he decided to teach instead. What caused his change of heart was the love that the principal, Kambayashi (Kotaro Satomi), who simply believed that the "children were lonely," poured into the delinquent students. What was even more startling was that these delinquents who were out of control were also members of the Fushimi Daiichi Kogyo High School rugby team. Yamagami faced his students, determined that he would "transform the school through rugby." But what he saw was a harsher reality that went beyond his wildest imagination and the teachers turned a blind eye to the students' violence. The rugby team in particular was in a terrible state. Yamagami stresses the basic spirit of rugby—"One for all, All for one"—but the students, as well as his colleagues, are unable to embrace Yamagami's passion, and the annoyance builds up. Over time, the rugby team seems to show signs of change. Yamagami sets off for the team's first away game in high spirits, but finds that the only person that shows up is a newly joined manager Michiyo (SAYAKA). The seniors who did not like Yamagami had stopped the younger members from going. "I can't deal with this any longer..." Yamagami falls into despair, and weeps. "But your teacher never gave up on you," his wife Etsuko (Emi Wakui) encourages him. Yamagami believes that students are searching for adults that seriously engage them and truly love them. His colleagues begin to be touched by Yamagami's attitudebut the seniors graduate without being won over by Yamagami. Although Yamagami feels powerless, after the graduation ceremony, he finds the once-wrecked club room sparkling clean, with a message from the seniors "We leave the rest to you." Yamagami discovers that the seniors had loved rugby in their own way, and his eyes water when he understands that he had not realized their feelings before. Spring 1975. Shingo (Katsuya Kobayashi), known as the worst in Kyoto, enters Fushimi Daiichi Kogyo High School. Yamagami sees a lonely heart hidden in his robust physique, and invites Shingo to join the rugby team. Yamagami visits his house many times to convince Shingo, who lives with his heavy drinker of a father. Yamagami and Shingo get into a fight and Yamagami's formidable tackle lands the two of them in the river. Etsuko warmly reaches out to both men as they pull themselves out of the river. But Shingo bolts, since he cannot genuinely accept the comfort of a family, which he experiences for the first time at that moment. The Kyoto prefectural tournament arrives without Shingo's presence. Obuchi (Asahi Uchida) and Arai (Tomohisa Yuge) go all out in the match, but they are sent flying like children by the sheer force of the opposing team. Shingo was there, watching in the crowds. The outcome was 112-0, an unprecedented shutout. At that point, something burst inside Yamagami. He says to the boys, hunched over in their defeat, "It was a tough match, guys." Obuchi and the others were surprised to hear this. They had expected shouts of abuse to be heaped on them. "Are you frustrated?" "I am so frustrated!!! I was too easy on myself, Coach! Hit me! Help me become a stronger person!" Obuchi breaks down into tears, followed by his teammates. With tears streaming down his face, Yamagami hits them one by one. Having turned over a new leaf, the rugby team channels its feverish energy into practice. Shingo also joins the team. As Yamagami expected, Shingo quickly emerges as a promising player. The year is 1976. Fushimi Daiichi Kogyo High School wins a trail of victories at the prefectural tournament. It was unbelievable, considering their crushing defeat the year before, but a new battle awaits them.